It was at business school at MIT in 1993 that I first saw the World Wide Web – a simple page on a PC, some of the text underlined, where a click would take you to another very similar looking page. Beaming, the friend showing me this purported miracle intoned, “This will change everything.” At the time, I was thoroughly unimpressed. 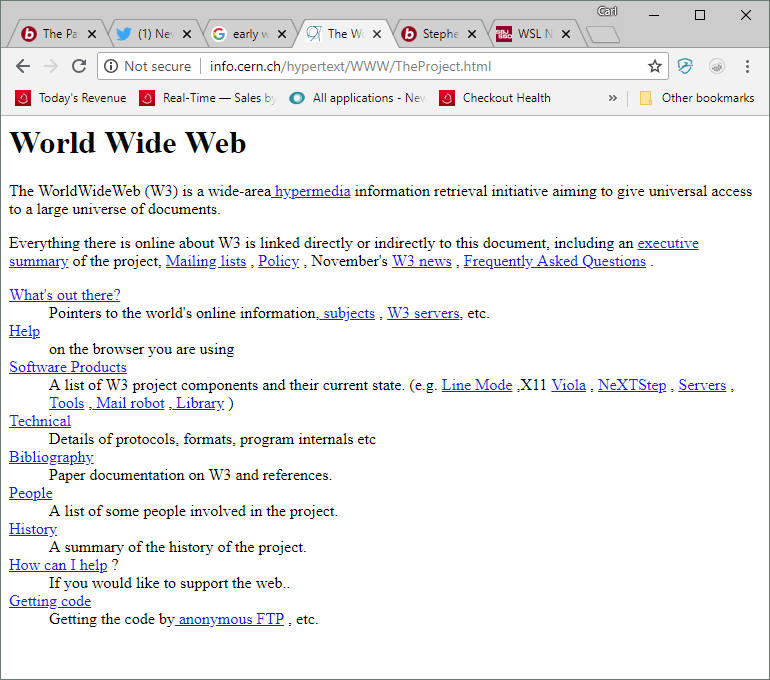 A 1992 screenshot of the first web page, launched internally at CERN on August 6, 1991. She, on the other hand, was right. Twenty five years later, it’s hard to imagine an area of our lives that hasn’t been transformed by the Web’s nearly limitless capacity to share information. Still, the internet hasn’t impacted everything equally or in the same way. This was a lesson my friend and I learned soon after business school. She was working for WebVan, an early “Amazon of Groceries” and I was at Furniture.com, the original “Amazon of Furniture.” Both were good examples of what worked very well for some online categories not working well at all for others. For both groceries and furniture, the technical, informational challenges of selling online were exciting, daunting and surmountable. It was the physical – delivery, overcoming the lack of a showroom – that proved fatal, at least back then. Today, just under 10% of retail sales are transacted online, with Amazon on track to do 50% of those transactions this year. Most of this volume is in easy to understand, easy to ship items, where the internet’s strengths are most easily leveraged. 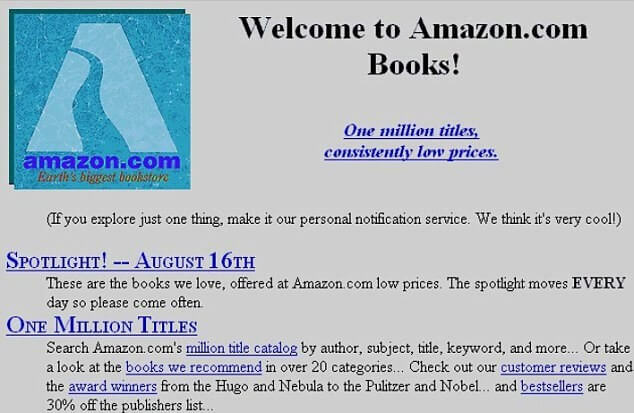 Despite looking the part, Jeff Bezos wasn’t a bookseller who put his bookstore online. Bezos was a hedge fund manager who shrewdly selected books to be the beachhead for Amazon, the website he launched in 1994. Books – easily understood, easily shipped, with a brick and mortar shopping experience easily disrupted by providing vast selection – proved right in the internet’s retail wheelhouse. Amazon’s success led to a frenzy of copycats, applying the Amazon model to less ideally-suited categories, powered by a torrent of capital willing to fund them to do so. The fundamental premise of these early dotcom models was the promise of vast selection at low prices, without the real estate or personnel expense of opening a store. More stuff, cheaper. As an attempted pure-play, Furniture.com was a perfect case study of a retail category stubbornly refusing to hop in an Amazon box. With over 250 smart, committed employees and nearly unlimited financial resources, we developed amazing technology for marketing and selling furniture. When Furniture.com ultimately closed, I spoke to a number of top 25 furniture retailers who were unsurprised by – and somewhat happy about – our demise. 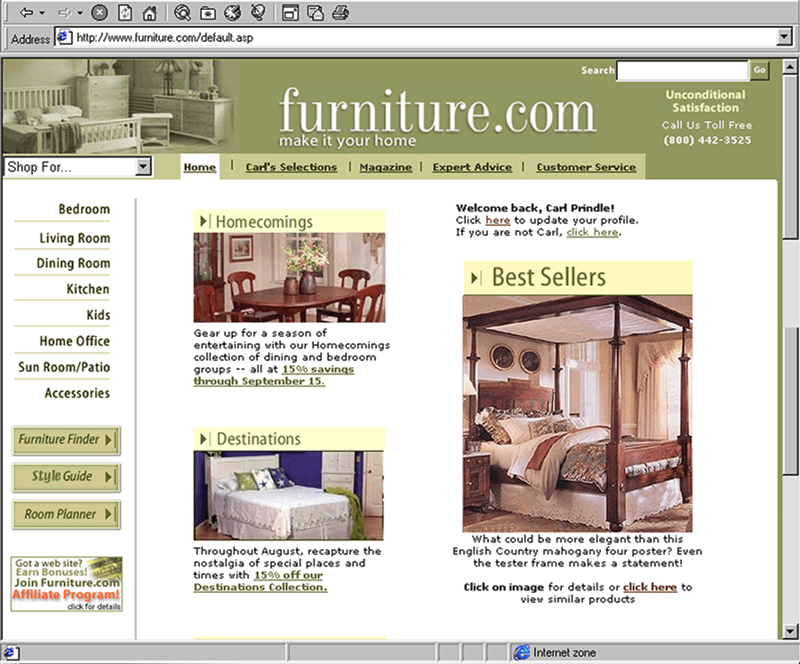 But, they also hinted that we were on to something, sharing that they’d had hundreds of shoppers in their stores carrying Furniture.com printouts, ready to buy. It wasn’t that Furniture.com hadn’t impacted furniture retail, it just wasn’t the same type of impact as the internet had on categories more readily suited for an Amazon box. With ill-suited dotcoms closing in droves and VC funding evaporating in the “nuclear winter” that followed, it seemed possible that vast swaths of retail would remain unaffected by the internet. 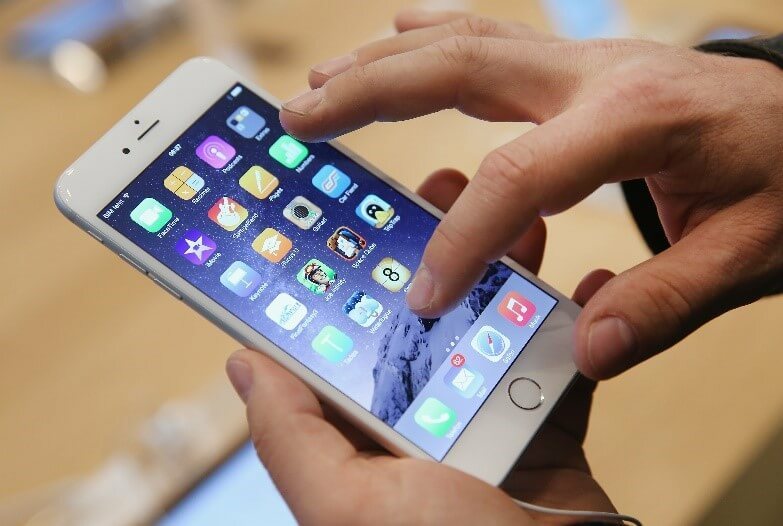 Then, Steve Jobs relit the internet’s retail fuse. Whereas the first wave of Digital Retail focused on replacing the store, these new capabilities made the second wave about enabling stores. As a result, this wave has had a far more profound impact on more of the retail landscape, particularly on big-ticket categories like furniture. Furniture retailers’ tried and true tactics of attracting customers – TV, Print and Radio – have been upended, with the internet both garnering shoppers’ attention, and raising the bar for smart, personalized advertising that traditional media can’t match. In furniture, that means making store visits easy and efficient – as simple as making a reservation with Open Table or getting a car with Uber. Engaging one of retailers’ biggest assets – salespeople, currently on the sideline of digital retail – in providing the assistance shoppers want, both online and off. It is meeting unique requirements like these that will unlock the internet’s true impact on furniture, and on the other 90% of retail. Arguably, the internet’s only superpower is to get people what they want more efficiently. 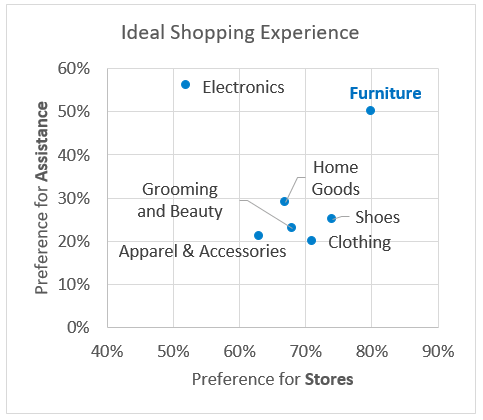 Thankfully for furniture retailers, furniture shoppers want a store and some help. To the extent that Amazon-style businesses (or Amazon itself) capture share in furniture, it’s because brick and mortar retailers have failed to deliver an experience that feels easy, relevant and personalized. Those retailers who leverage the internet and do so will prove as disruptive to the future of retail as those first dotcom insurgents, twenty five years ago. Carl Prindle is Founder and CEO of Blueport Commerce. To hear more from Carl, you can find him at this year’s Furniture Today Leadership Conference, where he will introduce a three-part conference module centering around the theme Holistic Retail. Make sure to attend the Holistic Retail session to learn more or catch up with Carl directly at any point during the conference. Blueport Commerce is the leading e-commerce platform for big-ticket retail, influencing over $4B in omnichannel sales annually. Brick-and-mortar retailers build their omnichannel websites on the Blueport Platform, providing better shopping experiences for their customers and driving sales online and in their stores. Contact us today to learn more.